Benaroya Hall Chamber Concert: Enescu, Janáček and Piazzolla! 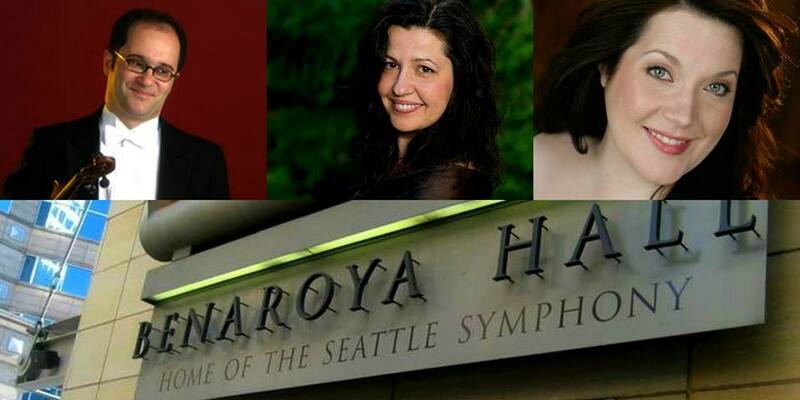 You're invited to attend an extraordinary chamber concert featuring world class musicians: Mikhail Shmidt, violinist at Seattle Symphony, Marcy Stonikas, soprano soloist at Seattle Opera and Oana Rusu Tomai, guest pianist at Seattle Symphony Chamber Series. You will enjoy George Enescu's Airs in Romanian Folk Style and superb song cycle Sept Chansons de Clément Marot, Leoš Janáček's mystical, dramatic Sonata for Violin and Piano, Astor Piazzolla's fiery Grand Tango and a few musical surprises! Konnectclub in partnership with Romanian American Society of Washington is offering 50% off tickets! Limited quantity. Consider buying your tickets ahead of time, sale ends early! Multiple tickets available. Looking forward to seeing you soon.